FINANCE MINISTER MICHAEL Noonan has said that he will consider “targeted tax reductions” to help boost employment. The Fine Gael Ard Fheis has been debating the economy with strong support for a motion to reduce the tax burden on working people and the clearest indication yet from Noonan that there will be a tax cut in the Budget this October. “Certainly as we examine our tax policies going forward the measurement won’t be what might get us votes or how we can buy an election, we’ve had a enough of that under Fianna Fáil,” he said to applause from delegates. 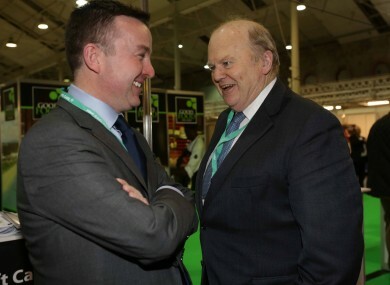 In pre-prepared remarks circulated to the media, Noonan warned against a return to “failed boom and bust policies of the past” and said: “As a Government, we know that there are further opportunities in the years ahead for us to build upon the initiatives that have worked. The Finance Minister also mounted a strong defence of Fine Gael’s policies in coalition government, saying recent positive economic figures indicated the plan had worked. “The policies worked and despite all the naysayers the proof that the policies worked is self-evident,” he said. Noonan also said that he wants to examine the possibility of creating a third pillar bank alongside AIB and Bank of Ireland and said he plans to have discussions on this in the coming weeks. Earlier junior finance minister Brian Hayes said the best way of creating economic growth is by ensuring “that we stop taxing the hell out of people”. “We now need to put back firmly on the agenda the whole question of giving workers a break in this country,” Hayes said. Jobs Minister Richard Bruton, whose speech to delegates was affected by sound problems and was briefly interrupted by Avicii’s ‘Wake Me Up’, said that as the economy recovers it is “not the time to lose our nerve”. In a warning to Social Protection Minister Joan Burton and her push for a living wage, Bruton said this was “not a time for wage hikes”. Earlier, Noonan was compared to Munster and Ireland rugby star Paul O’Connell by party colleague Damien English. “A true Limerick and Munster man: he is the Paul O’Connell of this Government. A model of calm and balance: but with a ferocious determination and focus when required,” English said of the veteran finance minister, adding he is a man “you wouldn’t want to tackle”. Speaking on the growth in the agriculture and food industry, Agriculture Minister Simon Coveney said this area had been “a good news” story throughout the economic crisis. He claimed that the growth in the sector means “we are now effectively feeding ten times our own population”. Earlier, Fine Gael delegates passed a motion to set up a working group that will explore the possibility of contesting elections in Northern Ireland. Embattled Justice Minister Alan Shatter is due to address the Ard Fheis later during a session on ‘transparency, accountability and justice’ and delegates will debate and vote on a motion to legalise cannabis. Email “Michael Noonan: I’ll consider tax cuts, Richard Bruton: I won’t consider wage hikes”. Feedback on “Michael Noonan: I’ll consider tax cuts, Richard Bruton: I won’t consider wage hikes”.